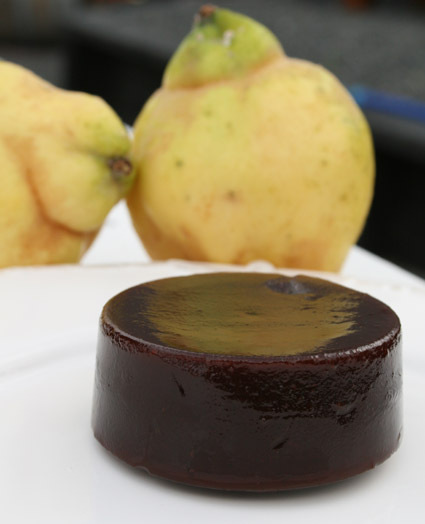 Quince paste: just like the bought stuff! It took an hour to peel, chop and core the quinces and another to simmer them until they were tender enough to puree, then eight hours in the slow cooker and about the same again in muffin tins in the oven at 100C… but in the end my quince paste turned out just like the bought stuff. Would I make it again? Hell no! Now I understand why it costs so much for those tiny tubs at the delicatessen. My advice? Just make quince jam and spread it on your cheese and crackers instead of slicing it up on your cheeseboard. It tastes the same for about 10 per cent of the hassle. I agree with you that its completely un economic time wise, but the pleasure of having a home made preserve, paste or cheese cannot be measured. Ive just spent all day making cheese and it now requires weeks of cossetting before its edible, but its a wonderful feeling. I bought Vodka this morning to make the quince Vodka recipe in your last blog…. and that will be months before we know if it was worth the time..just love doing these things and love your blog too. I must admit, the more time things take, and the more uneconomic they are, the more I want to do them 🙂 I bottled five jars of quinces last weekend. One blew up in the water bath, and one jar didn’t seal, which means it took us three hours to do three jars. But doesn’t it make your heart swell to see them all lined up on the bench? By the way, I used my blender, rather than a grater, to pulp the quinces for the vodka (I was being a little lazy). I wouldn’t recommend it as a short cut. It looks revolting (but I’m sure it will taste delicious). Plus I’ve since read this blog about making quince liqueur. You can call it “Ratafia de Coings”. I did make the paste, but that went sticky and hard, what went wrong ? You mention you had yours in the oven, what and when does that happen, even Allison Holst didn’t mention that. Any help, from anyone please….. Uh oh. Pink tasteless porridge… I suppose you could always mix it into your rolled oats to make a pink breakfast porridge? If your paste went sticky and hard, at least you were halfway there (the hard bit). I put mine in the oven because it only turned to paste on top; the stuff underneath was all jammy still. Then yesterday I was chatting to Rob from Heirloom Organix (who sells amazing fruit at the Parnell, Grey Lynn & Hobsonville Point Farmers’ Markets) and he said “bung it in the oven on the lowest possible heat overnight, with the door open, to dry it out a bit more”. Worked a treat. I do suggest you get yourself a dehydrator. I got one on Trade Me and it’s had a lot of use. I’ve just cooked my figs in syrup and dried them out in the dehydrator – I then bag them and store in the freezer, just in case, they keep for ages and make a lovely snack. I’m sure the quince paste would do the same and it’s cheaper and easier to run. Huge crop of figs this year and the birds haven’t found them yet only the wasps! To make Preserved Green Figs, you need 100g plain salt, 1kg unripe small green figs, 1 teaspoon baking soda, 1kg sugar, six slices of lemon (remove the seeds) and three fresh green chillies, deseeded and sliced lengthways. Dissolve the salt in 2 litres of water in a glass bowl. Cut a small cross in the base of each fig, then soak in the salty brine for 24 hours. Drain, rinse figs, and place in a pot with just enough water to cover. Stir in baking soda, bring to the boil and simmer for 15 minutes, till the figs are tender, then drain. To make the syrup, combine sugar with 300ml water and bring to the boil, stirring constantly. Add lemon slices and chillies and simmer for 5 minutes, until the syrup thickens slightly. Turn down the heat, pop in the figs and simmer ever-so gently, stirring from time to time, for up to two hours until the figs turn translucent. Then simply spoon figs into jars, discard chillies, top up with syrup and seal. Lynda, your quince paste looks yummy, but oooh, what a long process!! I think we will stick with our quince jelly!! My ‘husband’ is busy making another lot of the quince chutney we make. ( one of the recipes you published in the beautifully presented ‘Home Grown Recipes’book.) Thankyou for the copy.We will be busy making a lot of the recipes in it.Wonderful to have others personal,and treasured recipes. Take care and rest if you can. I might make your quince chutney next, although I really don’t need any more excuses to eat cheese! HI Lynda, Just please make the most of the opportunities for doing these fiddly things, as I am sorry to say that once you have had your baby you will just wonder where you got the time to do some of the things you are doing now. But the rewards of having a baby are just so great that you really do not mind. Just so enjoy hearing what you are up to and the fun things you do. Cheers Barbara. Everyone keeps warning me of that! I’m lucky to have access to two doting grandmothers too, so maybe they can mind the baby while I bake up a storm? You should be able to get quinces at your local farmers’ market Dawn. Not sure if they sell them at the supermarket – can’t say I’ve ever looked there. I remember my mother making this quince jam every year when I was growing up. It’s easy and would be great with cheese on crackers as you suggest! 2 lb whole quinces, 2 pints of water. Simmer till tender then pull quinces part with forks. Add 3 lb sugar and juice of 2 lemons – boil till set. 30 – 45 minutes. Thanks Elaine. Did she peel the quinces or just rub the fluff off them? How much does this recipe make, and can you double it or would you have to make separate batches?? It makes more than enough, would be my reply! (Because you pour it into containers about 1 inch deep, rather than into deep jars). It make enough to fill a large cake tin or 18 muffin tins. Plus the bigger the batch, the more likely it is that you’ll burn it before it has reduced sufficiently. Hi Ive just made my first batch of this and am wondering if I need to grease the muffin tin – I cant see baking paper being very effective in a muffin tin? I used a non-stick muffin tin and it didn’t stick (but it was a new tin). As it dries out, it slowly shrinks away from the tin. Then to get all the quince pastes out later, I waited until it was completely cold, then dipped the tin quickly into a roasting dish of boiling water and flipped it upside down, so they all slid out (much as you would with a dessert jelly in a mould).